Among the purple-backed trader cards there are 10 starting cards with a violet frame on the front. E Each player receives a "2 Tumeric" (yellow) and a conversion card as a starting hand. Return the other starting cards back to the box. Spices are represented by wooden cubes. Sort them by color and place them in the spice bowls. Note: Put the filled bowls in ascending order of their value as stocks on the table G: yellow (turmeric), red (saffron), green (cardamom), brown (cinnamon). Take as many caravan cards (gray back) as players are playing, including the one market with the purple start player symbol. Mix the cards and give each player a card. H The player with the symbol on their card is the start player. The player sequence is clockwise. Century is played over several rounds. Each player performs one action each turn (turns move clockwise, starting with the start player). Play a card: Play a card from your hand. Acquire: Get a new trader card. Rest: Take all the cards you've played back into your hand. Score: Claim a score card. If you play a spice card, take the number of spices of the appropriate color(s) A from the stock and place them on your caravan. 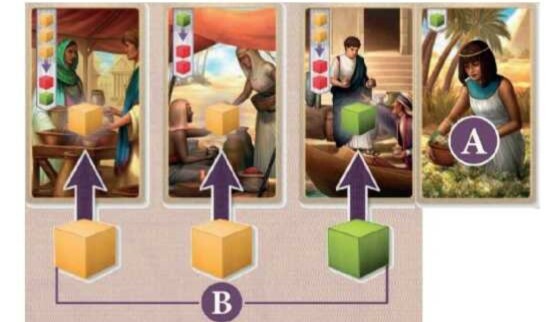 In the example shown, the player places 1 turmeric and 1 saffron on his caravan. If you play a conversion card, you may convert spices on your caravan into the next most valuable spice (i.e. yellow (turmeric), red (saffron), green (cardamom) , brown (cinnamon)) the number of times depicted on the card. You do not have to execute all conversions that are possible according to the card. In the illustrated example, you were allowed to turn a yellow turmeric into a red saffron and do the same again, or convert the converted saffron into a green cardamom. If you play an exchange card, put the spices above the arrow A from your caravan back into their bowls, and take the spices shown under the arrow B out of the stock and place them on your caravan. You may carry out the same exchange as many times as you wish in your train as long as you have the necessary spices. Example: Tom has 6 turmeric and plays a card with which he can exchange 2 turmeric for 1 cardamom. He can now exchange 2, 4, or 6 turmeric for 1, 2, or 3 cardamom. To acquire a trader card, you must place a spice of your choice from your caravan onto each card to the left of the one you wish to acquire, then place any spices already on your selected trader card into your caravan and pick up the card and put it into your hand. Note: The card on the far left you can acquire for free. Example: Tom would like to acquire the 4th trader card from the left A so he places one spice on each card to the left of it B. Slide the trader cards so that the resulting space is closed and a free space is created on the right side of the train stack. Draw the top card from the deck and place it in the free space. When you are resting, you take all the cards that you have played before back into your hand. (This allows you to expand your hand over the course of the game, i.e. to operate a kind of "deckbuilding"). 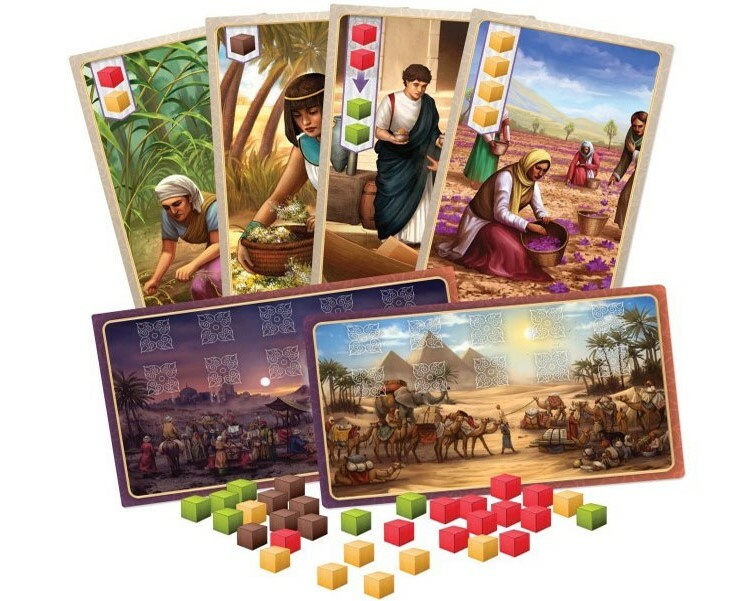 To take a scoring card, you must have all of the depicted spices on your caravan. Put these spices back into their bowls, take the scoring card and place it in front of you. Slide the scoring cards so that the resulting gap closes and a free space is created on the right side of the row. Draw the top card from the deck and place it in the free space. If you take the first or second point card from the left, take 1 gold or silver coin from above it. If you have taken the last gold coin, move the remaining silver coins from above the second card above the first card. 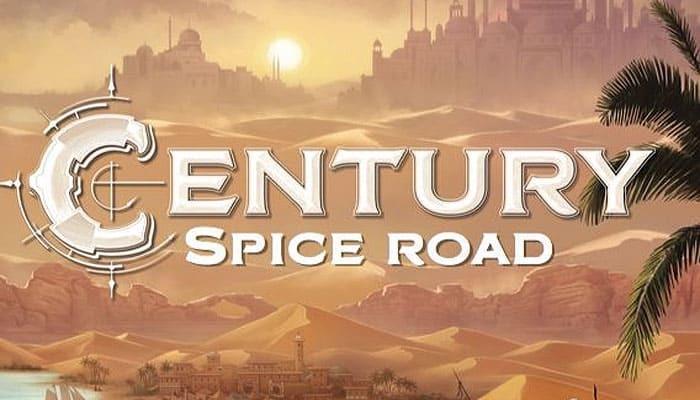 At the end of your turn, if you have more spices on your caravan than you can transport, you must return spices of your choice into the bowls until your upper limit is reached. A caravan can transport up to 10 spices. The spice stock is not limited. If a bowl is emptied, use another material or a multiplier as a replacement. If a player has his fifth point card (with 2 or 3 players, his sixth), the game ends after the current round. Each player earns the points on their scoring cards. In addition, each gold coin is worth 3 points, each silver coin is worth 1 point and all spices better than turmeric(yellow) earn 1 point per wooden cube. The player with the most points wins the game. In the case of a tie, the player who was later in turn order wins.